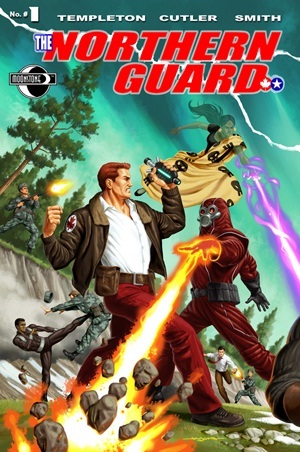 Debuting in November from Moonstone Books – THE NORTHERN GUARD returns to print many Canadian heroes that haven’t seen active duty since the 1940’s! Not only that, this book is 100% Canadian creatively as Ty Templeton writes, David Cutler draws, K.T. Smith colours AND letters – and finally – Jason Edmiston delivers some stunning painted covers for the project! Years ago, during the Golden Age of Comics, there was a group of colorful heroes who fought the good fight, stomped the bad criminals and wiped out the really evil Nazis, far from the eyes of American comic fans, up in the frozen North of Canada. With stars like trick Merlin, Ghost Woman, Freelance, Commader Steele, Johnny Canuck, Dr Destine,Nanook, Zor the Mighty, Blackwing, Purple Rider and Red Rogue, (amongst so many others), and publishers like ANGLO-AMERICAN, Bell Features, and HILLBOROUGH, the comic books of the wartime CANADIAN WHITES are considered by knowledgeable fans to be amongst the best created anywhere in the golden age. The professional quality of the art is surprisingly high, and the adventures are filled with rippling he-man goings-on and daring-do. But these stories have never seen print in the United States, and the characters have rarely been seen outside of Canada. 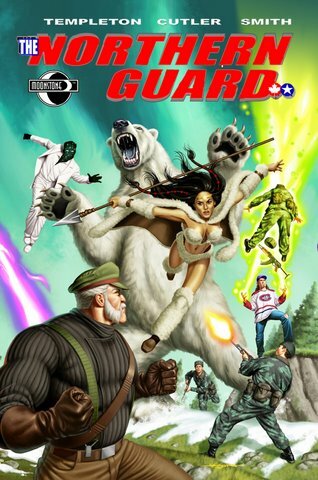 Moonstone Comics presents: Johnny Canuck and the Guardians of the North in THE NORTHERN GUARD: the series! Featuring all-new, full length stories, updating these classic characters for the 21st Century, complete with added, never before seen reprints of classic tales from the Golden Age for a punch filled package of epic comic adventure. ————————————- Our main story takes place in the middle of the 21st Century, when international competition for dwindling water and power resources have led the world to the brink of war. A mad Russian physicist attempts to impose his own peace on the belligerent nations, and sets off a device meant to disarm all the radioactive material on Earth. It was supposed to work all at once, no more nuclear devices, peace for all time. But it DIDN’T work that way, and instead it plunges most of the planet into a permanent and mysterious blackout. A new, electricity-free Dark Age, from which there seems to be no escape. All except for a one long stretch of North America — a hundred miles wide and three thousand miles long — through Alaska, across Canada, and down to Detroit through to New York City — the power is still working and the lights are still on. And the Red Rogue’s device that set all this in motion, seems to have given the locals super-powers. Can the North America of the 21st Century survive, surrounded by a desperate world stuck in the Dark Ages? And can Johnny Canuck and his Guardians bring back the balance of power, before European invaders destroy North America? ——————————————- The scripts are by Ty Templeton, who says he is “…thrilled to be updating these comic book icons for a new millennium. It’s a dance-on-my-toes dream come true for this hometown Canadian boy, ‘cause I’ve loved these characters my whole life. I have a few of the original Golden Age issues from back when I used to spend more of my allowance on comics than I should have at collector’s shows, in my twenties and early thirties. I’m hoping I handle Johnny, Freelance and the rest of them well enough that that they find new readers, and lure a few familiar readers back to see if we treat their heroes right. As a collector of Canadian comic books, especially those rare 1940’s, unique to Canada (never, ever distributed to the United States) Golden Age ‘Canadian Whites’, this is, indeed, exciting news! I already buy regularly many MOONSTONE comic book titles, including Lee Falk’s The Phantom, Captain Action, Domino Lady, The Spider, and many others! So this news that Moonstone (run by company owner Joe Gentile) is bringing back many of Canada’s golden age ‘Canadian Whites’ heroes is exciting news indeed, especially to a Canadian such as myself!